Summary : This tea from Culinary Teas is considered a breakfast tea, and has a nice, rich flavor to it. If you like traditional black teas, then this tea is for you. Otherwise, if your taste buds are a bit more adventurous, find something else for your morning brew. Review : I have a friend in the United Kingdom who lives and dies for traditional black tea. Our arguments are endless about the goods and bads of traditional black teas (he likes how traditional they are, I tell him how boring they are!). Most likely, this argument will go one for another 40 years or so...perhaps chalk it up to those peculiar differences between people living on the different sides of the pond and the unique hold that tradition seems to have on people from the United Kingdom. But as I was hoping to impress upon my english friend that, yes, Amercians are not entirely abnormal in the tea department...I decided to give a sampler package of Queen Mary Black Tea a try. This tea is created by Culinary Teas and is about as straight-up of a black tea as you'll likely find. Here is how Culinary Teas describes this tea on their website : "Queen Mary is a perfect breakfast tea. Good body but not overpowering. Coppery bright and excellent flavor. A traditional favorite." Any tea that says "traditional" somewhere on the package was bound to impress my friend in the UK, so I felt oddly compelled to sample this tea. Perhaps in hopes that my "unsophisticated American taste buds" could come to like this tea - thereby impressing my overseas friend with my newly discovered sophistication. Well, all I can say is, call me unsophisticated if you will, but I've come to the sad conclusion that me and normal black tea just are not meant to get along. At least not without lots and lots of help from various additives, such as sugar, milk, cream, honey and anything else that happens to be laying around that "is handy." Now please don't get me wrong here. This is a good tea...if you like traditional black tea. The flavor is very strong, yet is by no means bitter. The tea also has a beautiful color once brewed. But the taste of this tea, like so many other traditional black teas, is just well, so...boring! Where's the spice? Where's the new and unique flavor? Where's the kick in this tea that will really get you up and going? Truthfully, if this was the only tea I could drink for the rest of my life, I'd likely kill myself out of pure boredom! Or at least switch over to warmed up Kool-Aid or hot chocolate or something more "American." Overall, this is a fine black tea. If you like traditional black teas, I have no doubt that you will like this one. But if your taste-buds are a bit more adventurous than my friends are in the UK, then I suspect you may not like this tea that much! Recommendation : Yes, at least if you enjoy traditional black teas. I've discovered that I just don't much care for "straight up" black tea. Yet, despite this, I sort of liked this tea in an odd sort of way. This tea had a full body flavor to it and really does make for a good tea to have in the morning - although it is no replacement for a good Earl Grey Tea, that's for sure! Brewing Instructions : Pour 1 cup boiling water over tea leaves. Let brew for 3-5 minutes. Numi Teas Morning Rise Breakfast Blend Black Tea : Just your basic breakfast black tea that is a mix of black teas, that happily isn't bitter. 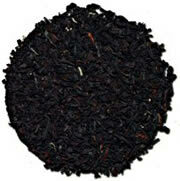 Republic of Tea Earl Greyer Black Tea : An exceptionally smooth and mildly spicy Earl Grey tea. Those who prefer a more "traditional" Earl Grey tea will love this tea.